The Production Warehouse recently won a Gold for their stand at Mediatech 2017 which showcased the latest products and boasted a time-coded light show. Mediatech Africa is a biennial advanced media and entertainment technology trade show held in Johannesburg, South Africa. The expo which was held at the Ticketpro dome from 19 to 21 July 2017 saw 145 exhibiting companies showcase the latest technology to 7465 visitors. 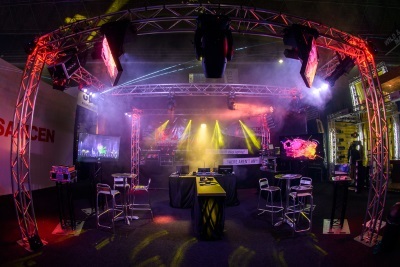 The Production Warehouse displayed various new products from Capture, ChamSys, Elation, Eurotruss, GIS, Hazebase and Lectrix. Programmed on ChamSys MagicQ by Shaniel Laloo. The rig saw its debut at the Matatiele Jazz fest in December. The new lighting rig made its debut at Cameron ward’s DVD recording ft. Hugh Masekela at the Orbit music venue in Johannesburg. – Elation Professional – 4 x ACL360 Bars, 4 x Sniper 2R’s, 2 x Platinum Spot LED Pro 2’s, 6 x Colour Pendants and an E-fly wireless DMX solution. TPW will be hosting training courses on Capture Atlas as well as ChamSys MagicQ during June/July. The team has invested in 14 x Elation Professional E-fly Transceivers & eNode 4 Artnet-DMX node. Eurotruss – 10M x 3M of Prostage decks with accessories, FD34 truss pieces. & various other top-notch gear. We are happy to announce our first reseller in South Africa, The Production Warehouse. As a kick off for the resellership they just introduced Capture to Africa during the Mediatech show in Johannesburg, where it received a very warm welcome. 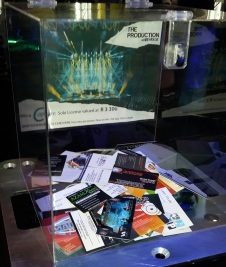 Special congratulations go out to Mikel-jes Productions in Namibia, who won the raffle during the show for a Capture license! Elation Professional has announced that The Production Warehouse of Johannesburg is a new sales partner for the company in South Africa, now stocking a full complement of Elation products. Started by brothers Jacques and Marnus Nieuwoudt in 2014, The Production Warehouse specializes in supply and installation of lighting and video equipment affordable and reliable enough to meet international touring standards while stressing a high level of service commitment. The Production Warehouse’s inventory now includes a full range of Elation products including the Platinum SBX hybrid moving head; Satura Spot CMY Pro moving head; award-winning Sniper 2R effect light; powerful Protron 3K LED Strobe; Cuepix Series of blinder/strip lights; Colour 5 Profile ellipsoidal spot; SixPar 200 LED colour changer; Rayzor Q12 LED wash with zoom; and more. The Production Warehouse will be exhibiting at the upcoming Mediatech Africa tradeshow 15-17 July at The Dome @ Northgate in Johannesburg and invite all interested lighting professionals to stop by Stand F-58 to see the new Elation equipment. Join us at Mediatech Africa; Stand F58. The Production Warehouse will have its official launch at Mediatech 2015. We will have plenty of our brands on Demo, Pop in at stand F58.